HotelRunner includes a two-way channel manager to manage your sales channels easily, feeding all channels simultaneously. Want to maximize your revenues from online channels? HotelRunner brings you many new online sales channels. This way you can maximize your online presence, enhance your occupancy rates without any risks of overbooking, and reach potential guests globally. Market your hotel worldwide with HotelRunner’s innovative technology and certified two-way integration functionality. Connect to the world’s leading booking websites from one central cloud application using our secure XML connection. Stop wasting time manually updating various online portals – such as your website, Facebook page, and online travel agencies. Avoid any risks and achieve rate parity with a central inventory. 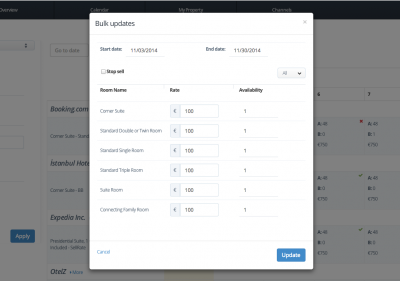 HotelRunner allows you to boost revenues, while reducing the time and cost it takes to update room inventory and rates. At the same time, we will provide you with centralized reports that will improve how you manage vacancies and pricing. HotelRunner supports all room types, rate plans and types, base and linked rates, meal plans, pricing types including promotions, guest-based, room-based and child pricing, open and close policies, allocations, allotments, free sell, last room availability, and channel specific restrictions as well as reservation modifications, cancellations and rebooking. 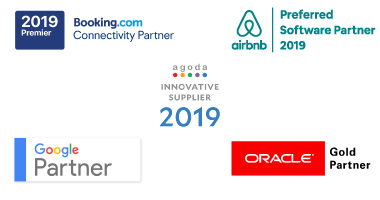 HotelRunner is the Premier Connectivity Partner of Booking.com, Preferred Software Partner of Airbnb, Innovative Supplier of Agoda, an Oracle Gold Partner and an authorized Google Hotel Ads Partner! Providing its services in accordance with the highest level of global standards, HotelRunner is not only the best channel manager in the market, but also committed to becoming certified and recognized by industry leaders to offer you the best online platform that suits the needs of your property. Promote your properties on multiple vacation rental websites, synchronize and publish your calendar automatically. HotelRunner is already connected to the world’s leading online booking channels and the list is expanding every single day.